Toyo Miyatake captured everyday life in Manzanar, including children gathering at the General Store in Block 21. Seventy of his camp photos are now on display at the Eastern California Museum in Independence. INDEPENDENCE, Calif. — The exhibit “Personal Responsibility: The Camp Photographs of Toyo Miyatake” opens on Saturday, April 7, at the Eastern California Museum in Independence. 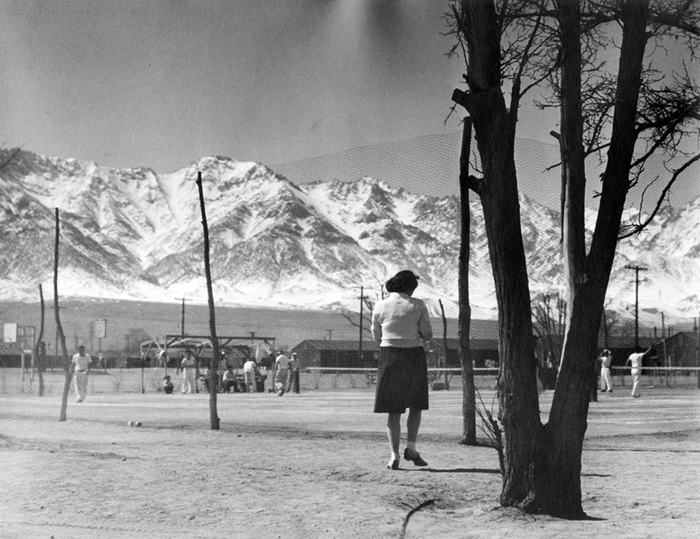 The exhibit features more than 70 black-and-white photos by Toyo Miyatake, showing many aspects of life in the Manzanar Relocation Center during World War II. There will be a brief presentation at 2 p.m., and light refreshments will be served throughout the day. The museum is located at 155 N. Grant St. in Independence, about six miles north of the Manzanar National Historic Site, and is open from 10 a.m. to 5 p.m.
Miyatake was born in Japan and moved to America with his family when he was 14. He became a well-known and highly respected photographer in Los Angeles. His photographs included traditional portraits as well as cutting-edge, modern photography featured in numerous exhibits in the U.S. and abroad. When he and his family were interned at Manzanar, Miyatake felt it was his responsibility to document camp life. He smuggled into camp a camera lens and film, and his first photos were taken using a wooden box camera made in camp. Eventually he was allowed to use his own photo equipment. 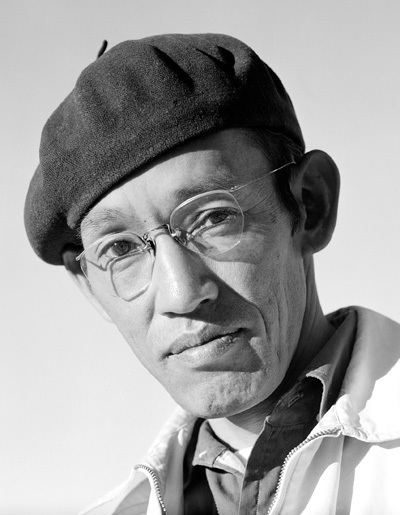 His photos of Manzanar have been included in many books, and are often likened, in quality, technique and storytelling, to Manzanar photos taken by contemporaries such as Ansel Adams and Dorothea Lange. 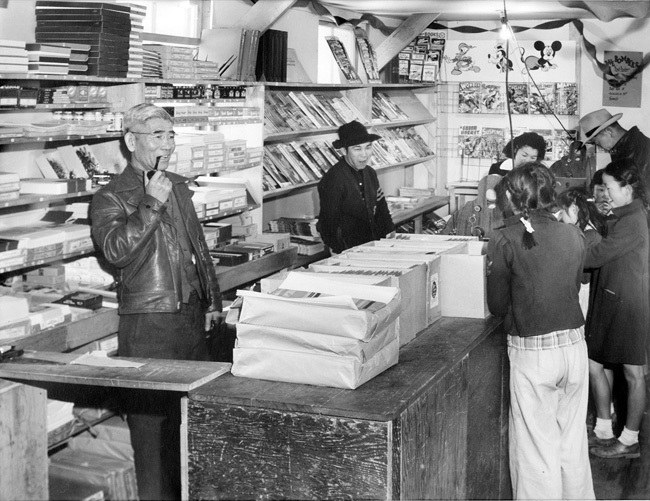 After the war, Miyatake returned to his studio in Little Tokyo. The museum-quality prints in the exhibit were created by his son, Archie, who took over the Miyatake Studio after his father retired. The museum has extended the hours of its annual Manazanar Reception on the Friday before the Manzanar Pilgrimage, to allow those coming to the pilgrimage an additional opportunity to see the exhibit. The annual reception will be held from 2 to 8 p.m. on Friday, April 27. Funding to purchase the photo prints in the exhibit was provided by a California Civil Liberties Public Education Program grant in 2000. In 2011, Miyatake’s many contributions to his community and to photography before, during and after his internment led to him being honored and remembered by having a street in Little Tokyo named Toyo Miyatake Way, and the installation of a bronze relief of the photographer. The exhibit will be on display until February 2013. For more information, call (760) 878-0258.